San Francisco Joins Oakland With Highest Minimum Wage in U.S.
San Francisco's minimum wage is going up today to $12.25 an hour, tied with Oakland for the highest in the nation. Today's increase is the city's second raise this year. It's all a part of the overwhelmingly approved Proposition J, which will bring San Francisco's minimum wage to $15 by 2018. The National Employment Law Project is estimating that 142,000 workers in the city will see a boost in their paychecks. Emeryville may be the next Bay Area city to raise its minimum wage to $12.25. Its City Council is set to vote on the measure next week. "Fast food workers have been an incredible inspiration in the fight for $15," said Alysabeth Alexander, Service Employees International Union 1021's vice president of politics. "They have sparked a mass movement on behalf of all the low-wage workers in our society. This economy is not working for everyday workers. We need to fight for $15, raise the minimum wage and treat workers with the dignity and respect they deserve," Alexander said. A proposal in Emeryville will be considered on the first reading by the City Council and calls for a minimum wage of nearly $16 by 2019, with workers at major employers earning an immediate jump to $14.42. The proposal also guarantees paid sick days for workers, protects tips and ensures wage increases alongside inflation, SEIU officials said. In June, Berkeley's Labor Commission will bring the City Council a proposal to raise the city's minimum wage to $15.99 by 2017. Currently the minimum wage in Berkeley is $10. "We are winning the Bay Area's fight for $15. 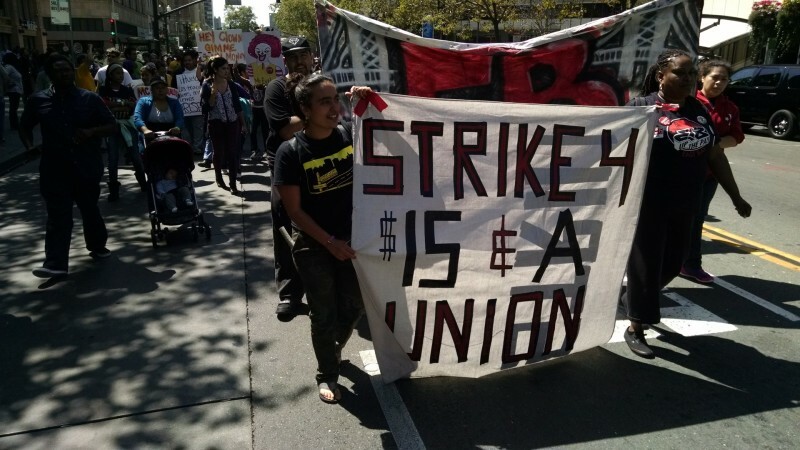 The Bay Area is moving to develop the first regional standard in the country for wages and working conditions," said Gary Jimenez, SEIU 1021's vice president for the East Bay. "San Francisco and Oakland have set the standard, now it's time to expand to Berkeley, Richmond, Emeryville and beyond." Voters in both San Francisco and Oakland overwhelmingly approved the raises last November. In San Francisco, proposition J won with 78 percent of the vote; in Oakland, Measure FF won with 82 percent. The two initiatives were each originally filed by a coalition of SEIU members, community-based organizations and fellow labor unions.